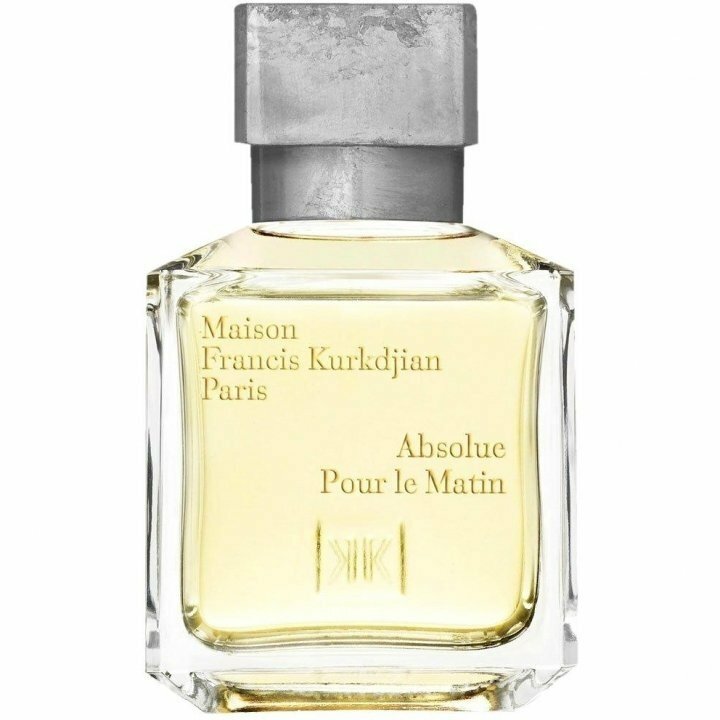 Absolue Pour le Matin is a perfume by Maison Francis Kurkdjian for women and men and was released in 2010. The scent is fresh-powdery. It is still in production. When I first smelled ABSOLUE POUR LE MATIN in the bottle and on the paper, it was quite shocking and surprising. It evoked a shed growing herbs in the root of the walls, with Swedish bitter, so it was a fuddled, old scent - competely amazing. After donning it the result was different. If you have a sample, please try this: smell it in 5-10 cm distance from your skin and from totally close. There will fly distinct fragrances. From far it is more creamy, from near it recalls materials which are workers operating with, so mainly chemicals. It was unfortunately sickening to me, but now, that I think it over, the fragrances including Neroli are always the same to me. It has something to do with personal chemistry. My friend, a lady tried it as well, she felt something sweet and floral from near and something spicy from far. So I encourage everybody who has interest in ABSOLUE POUR LE MATIN to try a sample first. Clean, crisp and fresh ... and above all YUM!! Completely on the other end of the scale to its relation Absolue Pour le Soir, Absolue Pour le Matin is a consummate joy on the skin. Invigorating (as one would want to feel in the mornings) this composition takes the classic 'eau de cologne' into niche territory. A good ol' bracing dash of 4711 on a hot day can't be beat, except when one really loves Neroli (as I do) and wishes that the freshness of Bergamot and Lemon would hang around longer ... as it does here. Absolue Pour le Matin satisfies my longing for a lasting 'cologne' like very little else does. A slightly aroma chemical opening ( for about 30 seconds) develops into a Neroli and herb laden garden smell, before a silvery Iris comes wafting through like mist coming off water. The hesperides here continue their liveliness for most of the development phase of this fragrance ... and I swear I can still smell the Lemon long into the powdery, woodsy dry down ... hanging out in the back, brightening everything up, like the glimmer of sunshine prismatically arcing through a dewdrop about to fall from a leaf. When compared to offerings like Neroli Portofino, this Neroli-centric fragrance makes one realize the difference between 'crass' and 'elegant' ... between loud vulgarity and polite decency. Absolue Pour le Matin isn't going to break any sillage or longevity records, but one hopes that as the morning ends and this fragrance has left only a trace of powdery softness behind on the skin, one is ready for something a little more voluptuous ... or just another application of the same! grace and refinement it brings! Write the first Review for Absolue Pour le Matin!